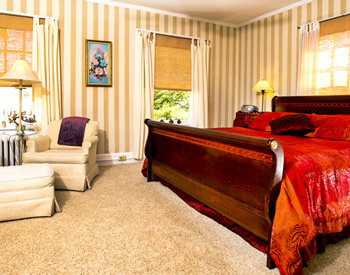 The Inn on Crescent Lake offers luxury bed and breakfast lodging consisting of 10 uniquely decorated rooms and suites. All rooms have private baths (each equipped with hairdryer and complimentary soap and shampoo/conditioner); central air-conditioning and heat with individual temperature control; radio/alarm clock with smartphone speaker system; and a flat-screen television with premium cable programming and a DVD player. Please note that three-day weekends like Memorial Day and Labor Day have a two-night minimum required booking. To preserve the tranquil atmosphere of the Inn, groups of three or more couples will be required to book the Cottage as one of the rooms in their block to serve as their gathering place. 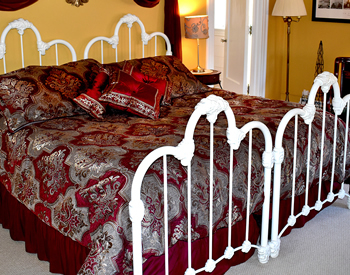 Any reservation of three or more room nights will require a 50% deposit paid at the time of booking. A personal computer is located in the living room of the inn, allowing you access to the Internet, or you can bring your laptop or other smart device and connect to our free Wi-Fi. 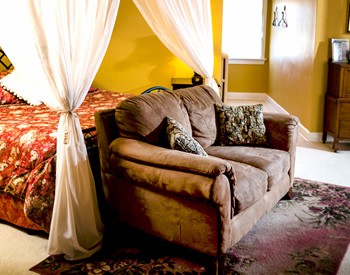 For a relaxing Missouri getaway experience, we offer every convenience you might find in a hotel, along with the warmth and charm of a bed and breakfast. Eight rooms are located in the Main Mansion of the Inn, a 100-year-old Georgian Colonial mansion that conjures up images of Tara and “Gone with the Wind” with its four soaring white columns. The third floor contains two large suites (Ballroom and Crescent) that are both spacious and quiet. 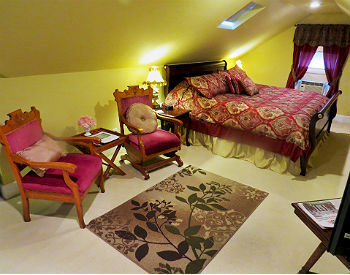 Each suite has a sitting area and views of the peaceful country setting. 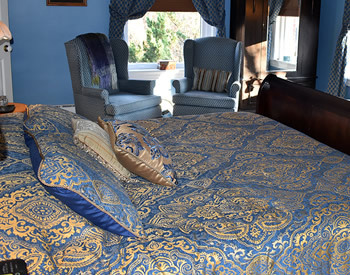 The five rooms on the Mansion’s second floor (McCleary, Paris, Stripe, Emerald Rose, and Casbah) offer variety in terms of bed size and style of decor. 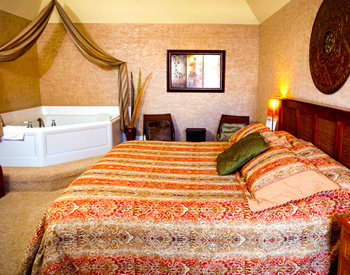 Choose from period claw-foot tubs, Jacuzzi tubs, king- or queen-sized beds, and different views of the grounds. 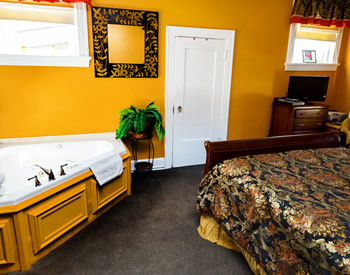 The first-floor Garden room is ADA compliant, and it features a private entrance and its own private outdoor hot tub. There are two separate buildings in addition to the Main Mansion: the Cottage and the Pool House. 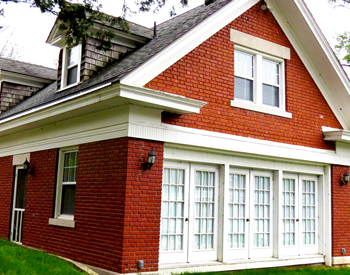 The Cottage is a private two-story bungalow located by the lake. The large, airy Tuscany Suite is tucked away in the Pool House with awesome views of the lake and pool. 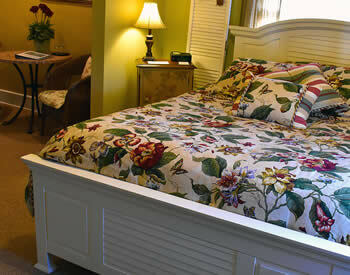 Each room at the Inn on Crescent Lake is private, spacious, and decorated with your comfort in mind. 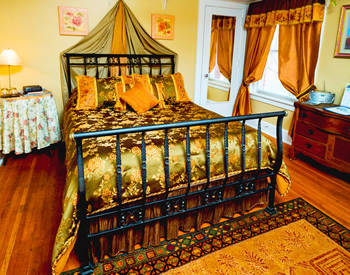 All rooms come with a complete hot breakfast for two each morning and full use of all the inn’s amenities, including the outdoor seven-person hot tub, walking path, paddle boats, fishing, and swimming in the pool. Please review our Inn Policies before making your reservation. For our guests’ comfort, smoking is allowed only in designated areas. We do not allow unregistered guests, visitors, or pets. Children under 16 are allowed ONLY when the entire estate is rented for a special event.